That all citizens experience the wonders of the marine environment and are equipped with the knowledge and investigative skills to address the greatest challenges that face humanity. Salish Sea Expeditions inspires youth to connect with the marine environment through boat-based scientific inquiry and hands-on learning, instilling curiosity, confidence, and critical thinking. Salish programs invite students to own scientific discovery unlike any other program in the Pacific Northwest. The core of our programs is student-led scientific discovery, where science comes alive for students as they engage in real-world data collection and analysis. Salish partners with schools to deliver unique and meaningful STEM curricula not possible in a classroom setting. Salish offers a unique educational experience aligned with national standards to help teachers reach their students at a whole new level. Salish inspires students to pursue STEM-related and maritime fields. Approximately 80 percent of our alumni reported increased interest in STEM-related, maritime or environmental fields of study. 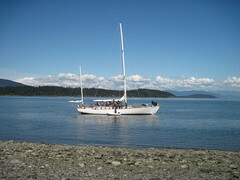 Salish Sea Expeditions was formed in 1994 by co-founders Kathy Murphy and Sophy Johnston. That same year, Four Winds * Westward Ho Camp on Orcas Island, Washington, was planning the construction of a 60-foot sailboat to be used by the camp during the summer months. 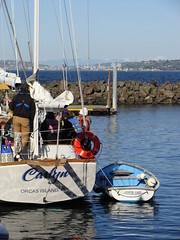 Kathy and Sophy, connected to Four Winds and well-experienced in the world of boat-based education, saw an opportunity to create a unique science education program that would utilize the vessel during the school year. After consulting with teachers and administrators, it became clear that there was a need for a program to give middle and high school students the opportunity to do real hands-on science through student-designed, boat-based research expeditions. Following inquiry-based methodologies, students are given control and ownership of all aspects of their Salish learning experience, with the belief that students would develop a joy for learning and a new-found appreciation for science that they would carry back to their traditional classroom settings. As construction of the new vessel progressed, so did exciting plans for Salish. 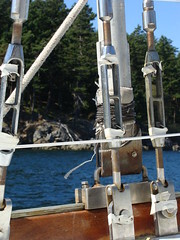 Much of the original vessel design was influenced by the programmatic visions. 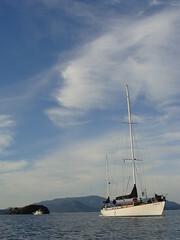 In 1996, Salish was granted non-profit status and the vessel, christened Carlyn, was completed. Salish’s first programs were conducted in the spring of 1997. Since then, Salish has rapidly evolved into a full-fledged educational institution that has served more that 15,000 students. Programs are organized at our small headquarters on Bainbridge Island, and occur throughout Puget Sound between October and May; expeditions take place as far south as Tacoma and as far north as the San Juan Islands. 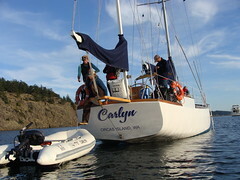 During summer months, Carlyn returns to her home base on Orcas Island. Integral to the success has been a history of outstanding organizational and program leadership and our continuing ability to recruit gifted educators. As our success grows, so do our plans to expand: to reach more students, especially those at lower income levels, to create more learning opportunities for all ages, and to integrate more fully into the regional science and environmental communities through novel partnerships and collaborations.